Jim Clifford: Where do you work? How does environmental history contribute to your job? Keri Cronin: I am the Chair of the Visual Arts Department at Brock University. I am a historian of visual culture and I bring environmental history and ecocritical perspectives to many of the classes I teach. While I don’t teach a course specifically on environmental art history or ecocritical approaches to visual culture, there are many opportunities to engage students in these perspectives. For example, in my 19th century art history course, we consider how different understandings of “nature” and “the environment” influenced landscape painting during this era. 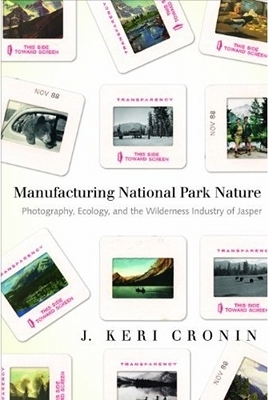 KC: Yes, I published Manufacturing National Park Nature: Photography, Ecology and the Wilderness Industry of Jasper with UBC Press in 2011. This book looks at the visual culture of Jasper National Park and considers the relationship between how this landscape has been pictured and the environmental history of this region. How, for example, does the way a space is represented shape policies and visitor expectations? How do these images influence dominant understandings of concepts like “wilderness” or “wildlife.” The book deals with a wide range of visual culture: paintings, photographic postcards, film, illustrated guidebooks, etc. JC: What got you interested in this topic? KC: I’ve spent a lot of time in Jasper National Park. It was a place that we often went to on family vacations when I was growing up. As I was thinking through the relationships that exist between representations of a landscape and the actual physical experience of that same space it made sense to me to reflect on a location that I have this level of familiarity with. In a broader sense, I chose to focus my research on a National Park because of the symbolic and cultural associations with these spaces in Canada–they hold a lot of weight when we consider how ideas about others species are formed and perpetuated. KC: My current research is an exploration of the ways in which early animal rights activists (late 19th century) used art and visual culture in their campaigns. JC: What contribution do you hope to make the wider field of Canadian environmental history with these projects? KC: My new research does not focus exclusively on Canadian material, I am working with archives in Britain and the United States as well. The contribution I would like to make with my research is to bring to the forefront just how prominent art and visual culture are in shaping our relationships with other species. Whether it is a fragile forest ecosystem or the treatment of animals in agriculture, what we are trained to see (or, conversely, what remains “out of view”) goes a long way towards our understandings of and, ultimately, our treatment of the species we share the planet with.